Concerned about ballooning house prices in Toronto, federal Finance Minister Bill Morneau wants a high-level meeting with Ontario Finance Minister Charles Sousa and Toronto Mayor John Tory in the coming weeks to look at possible remedies to ease the costs of home ownership, the Star has learned. 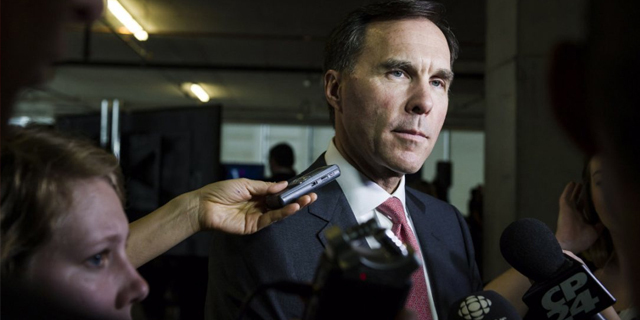 Morneau wrote Sousa and Tory separately Wednesday asking to meet soon to “consider how we can collectively make progress to ensure that housing in the GTA is both affordable and accessible for the long term. “I am concerned that dramatic house price increases will have long-term implications for housing affordability and housing market stability,” Morneau wrote in his letters, which were obtained by the Star. “I believe we must take a closer look at these evolving market conditions and take stock of (the) implications for our largest urban area,” the finance minister said. Morneau’s appeal for a political tête-à-tête comes at a time when all three levels of government are grappling with how best to address concerns that the red-hot market is leaving frustrated families priced out of home ownership. Morneau, who represents the downtown riding of Toronto Centre, notes that both Sousa and Tory share his “growing concerns about access to affordable housing” across the region. In his letter, Morneau said he’s also worried that some families, encouraged by low interest rates, have taken on high debt loads to get into the housing market, “making them susceptible to changing economic conditions. “As prices have risen, middle-class Canadians have become increasingly worried about being able to afford a home for their families,” he said. Morneau cited the recent housing market assessment prepared by Canada Mortgage and Housing Corporation that found “problematic conditions” in the Greater Toronto Area. Over a 12-month period, house prices across the GTA have seen double-digit percentage increases, the assessment said. “Due to a high number of sales and a relatively stable number of new listings over the past year, there were more buyers chasing the same number of listings, which resulted in sale prices often exceeding list prices,” the report said. And while the number of listings was up in March, competition among buyers has remained stiff. The average home price in Greater Toronto was $916,567 in March, up $228,556 from the same period a year earlier, according to the Toronto Real Estate Board. Political leaders have been casting around for possible remedies. Tory recently held a roundtable with housing and real estate experts. Afterwards, the mayor said the province and city are considering a tax on vacant houses and condos to curb property speculation. Sousa wrote Morneau in March asking Ottawa to “consider options” such as raising the capital gains tax on residential home sales that don’t qualify for the principal residence exemption. That would help cool speculative purchases, Sousa said. Housing prices have outpaced wage increases for years, Sousa said, making it challenging for young families and others looking to buy their first home. Ontario is expected to make its own moves on the issue in the provincial budget Apr. 27. Sousa met with B.C. Finance Minister Michael de Jong to discuss the 15-per-cent tax on foreign home buyers that British Columbia brought in last year to dampen rising house prices. As Morneau notes in his letter, the issue has been on Ottawa’s radar screen, too, though last month’s federal budget offered no new measures. Last year, he created a working group of officials from the federal government, the provinces of Ontario and British Columbia and the cities of Vancouver and Toronto to provide ongoing advice about supply and demand and affordability. The federal government also changed mortgage rules to end tax breaks for non-residents and make it harder to qualify for mortgages. “Getting this right in any given market requires co-ordination and, most importantly, sharing of information,” the official said.